Gabriel “Gabe” Williams (Ben Affleck) is good-for-nothing truck driver who hasn’t seen his estranged wife Jenny (Amy Adams) or their son in years. Once a respectable family man, Gabe lost all of the family’s money in illegal black market video game competitions, which resulted in the disillusion of his marriage and began his solitary life on the road. While on the road, Gabe still manages to feed his video game gambling addiction by playing underground tournaments at various truck stops. The problem is Gabe’s competitive streak exceeds his talent and he usually loses. Gabe’s son Michael (Asa Butterfield) is a troubled adolescent who can’t stay out of the counselor’s office at school. Constantly picked on but never one to back down from a fight, trouble follows Michael wherever he goes. His bad behavior has only increased since his dad left the family. Michael also happens to be a prodigious video game player who hustles the local teens in games of Halo 4 every night. One night, challenged by rival truck driver and video game player Jax Turner (Timothy Olyphant) Gabe puts up everything he has left in his bank account in an online Halo tournament. A heated showdown ensues and soon only three players are left in the tournament: Gabe, Jax, and a third player with the gamer tag “Mike-chine Gun”. Mike-chine Gun, whoever he is, has been flawless in his play so far. He’s the heavy favorite. Mike-chine Gun is his son Michael. Gabe, reeling from the shock of this revelation, is caught off guard and killed by Jax. Jax has won the tournament and all the money. Gabe throws his controller on the ground, runs into his semi, and speeds off. He needs to find his son and take advantage of his natural video game abilities so he can win his money back. Excited by this prospect, Gabe drives extremely fast and recklessly. On one particularly treacherous turn, Gabe (who’s drumming his steering wheel to the beat of Metallica’s Enter Sandman (which is playing loudly on the soundtrack)) speeds too fast around the turn and careens off a high cliff. We open up on Gabe in Heaven. He meets and has a conversation with an enigmatic God (Eugene Levy) who tells him he cannot be welcomed into Heaven because he has unfinished business. Gabe does not know what this means and angrily demands answers. Smiling mischievously, God simply tells him he’ll figure it out. Gabe wakes up back on Earth in a dusty old diner. Except now, he has a halo, angel wings, and no one seems to be able to see or hear him. Gabe travels to a few places (his old truck garage where his co-workers are having conversations about how he was a great truck driver but a bad father because of it, the front seat of Jax’s truck where he gleefully counts the money he won in last night’s tournament, his ex-wife’s house) but no one notices him. Finally, remembering where he was going when he died, Gabe visits his son’s bedroom where Michael is sleeping. 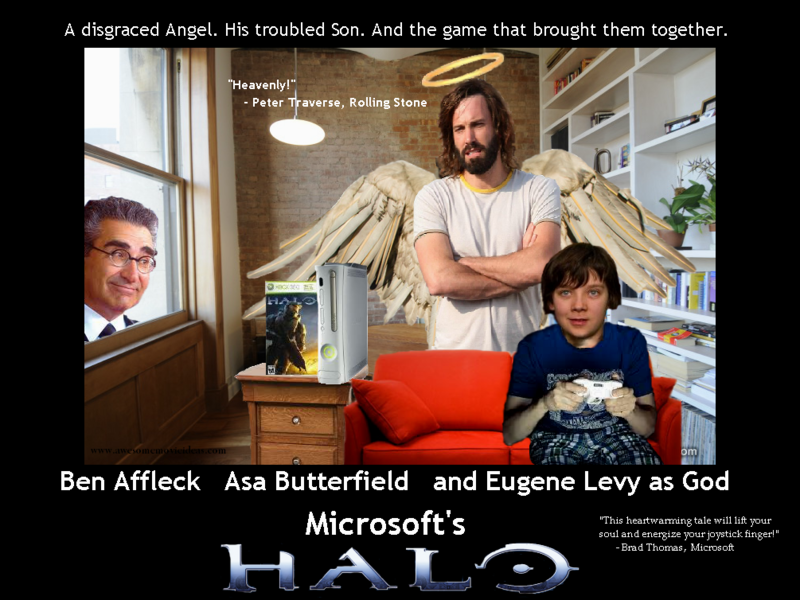 Gabe looks around and sees all the posters and decorations in Michael’s room (he stops for a long minute on a poster for the National 2012 Halo 4 Tournament being held in 3 weeks) and realizes he never really knew his son. Gabe sits at the foot of his son’s bed, devastated by everything he neglected when he was alive. Then Michael wakes up and freaks the hell out. “WHY ARE YOU ON MY BED DRESSED LIKE SOME GAY ANGEL! ?” he demands. Michael, as it turns out, can see Gabe. Michael is extremely angry with his father and wants nothing to do with him. Gabe, realizing that this is the only person who can see and hear him will not give up. The relationship starts out very rocky but after a few scenes of fighting and arguing, father and son begrudgingly begin to bond over the video games they each love so much. Gabe watches Michael dominate the competition in Halo 4 and realizes what his unfinished business is: To repair his relationship with his son. 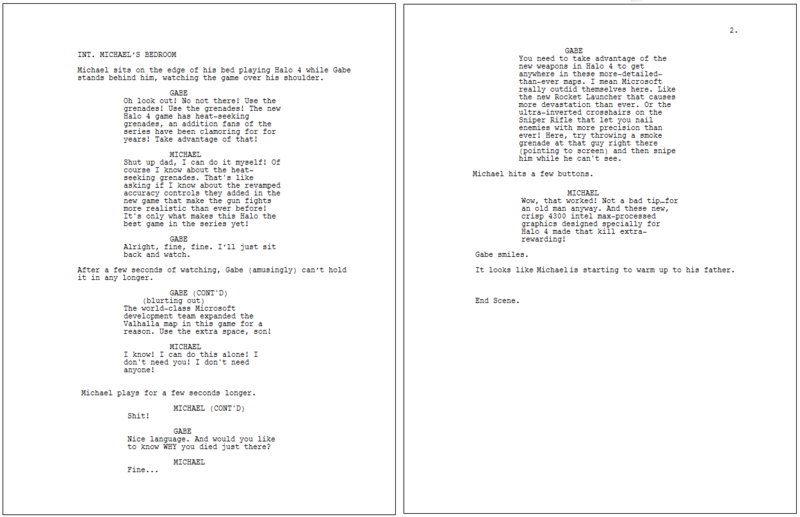 The rest of Act II is a “road movie” where Gabe and Michael travel truck stop to truck stop, beating the competition as a team (Gabe shouting tips to Michael, Michael often answering back while everyone looks confused at who he’s talking to) and winning money. After a heart-warming montage, they have finally won enough money to enter the National 2012 Halo Tournament. Michael and Gabe battle their way through the 2012 National Halo Tournament by working together. The action is exciting and plenty of time is dedicated to showing game play from the latest Halo game (product placement opportunity). Michael makes it all the way to the finals where he must face off, in a shocking surprise, against Jax Turner. A long gunfight takes place until Jax has a weapon-less Michael cornered, just like his father on the night he died. As Jax prepares to fire the final shot, Gabe frantically dives in front of the giant screen in front of Jax, which somehow causes Jax’s vision to go temporarily blurry for a split second. Taking advantage of this momentary delay, Michael jumps over to a gun on the ground, loads it, and shoots Jax in the head all in one motion. Michael has won. The crowd goes wild. In the midst of a giant celebration, Michael works his way over to his Dad. “How did you do that?” he asks. “I’m not sure how, but I do know why”, Gabe says. “It was the right thing to do”. Even though he can’t touch him Michael moves into hug Gabe. During this hug, Gabe curiously becomes solid in Michael’s arms. Gabe is alive. Michael’s mother (Amy Adams) runs up to them and after asking how all this happened (Michael (laughing): “It’s a long story…”) she realizes that Gabe is a changed man and that he has finally put his family first. They kiss and get back together. The newly reunited family walks out of the building with their arms around each other and the trophy in Michael’s hand. They pass by a smiling figure who looks suspiciously like God. He’s applauding and has a huge smile on his face. An assistant-type person leans in and asks him “Why’d you let him come back? Isn’t that against code?” God replies “You know what I like about Video Games? Sometimes when you think it’s over you’re given a “Continue” button and the chance to try again.” He smiles mischievously and walks away. We return to watch Gabe and Michael walk off from behind. Michael hands one side of the trophy to his father and the two men lift it over their heads together. We freeze frame on this image as “Spirit in the Sky” begins blasting on the soundtrack.